Written by Tallboy on 02 August 2014 . On Tuesday, July 29th, the number of unemployed workers in Western New York fell by a factor of one, when “Travis” the Muck Truck finally came out of storage and found his first job. It’s no secret that this has been a very wet riding year. 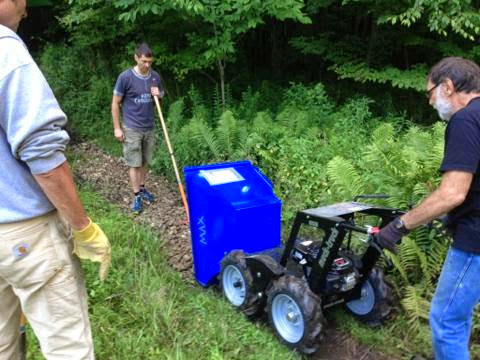 Many of the trails in our riding areas need attention and this week, the Rain Trail in Ellicottville got a little TLC in the form of six tons of crushed stone, spread with the help of eight mid-week volunteers and WNYMBA’s new powered wheel barrow. Thanks to Mark Lawrence and Dennis Baldwin for heading up the work night. 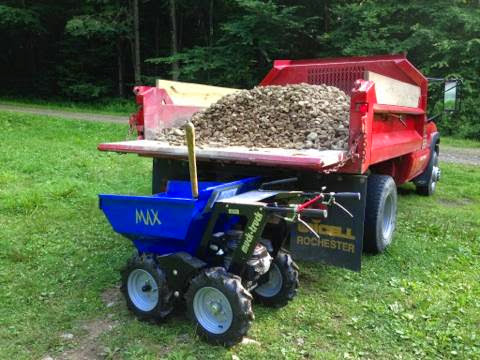 Huge thanks go to Jack Kramer too, a long-time club member and owner of Ellicottville Landscaping for the use of his dump truck. Anyone who’s tried shoveling crushed stone off the ground knows how much work Jack saved the group by allowing us to slide the stone off his truck directly into Travis. The next mid-week work night is scheduled for Wednesday August 13 at 6:00 PM. Meet at the Rain Trail parking lot on E. McCarty Hill Rd. and see Travis go! More details on the “Events” calendar.